Asset Protection Watertown: What is Medicaid? What is Medicare? If you have suffered through a medical emergency, you know how difficult recovery can be. In addition to the physical problems, concern over the cost of your hospitalization and ongoing care can be just as difficult to handle. As the cost of care has skyrocketed over the decades, many people have gone bankrupt trying to cover medical costs, while others fear growing older because they don’t know what will happen as they age. To help people better afford their medical care, the government created Medicaid and Medicare to aid those who need it most: people without a lot of money, and older Americans who may not have the income necessary to pay for medical bills. While Medicare and Medicaid sound similar, the programs themselves are actually quite different. Learn about what makes them different, and when you may apply for each of them. Call Safe Harbor Wills & Trusts today to learn about the ways that our office can help you when you are applying for Medicaid. With our guidance, you are less likely to be rejected, as we understand these programs and know what the latest requirements are for residents of New York. Our firm is also ready to help you plan for the future with asset protection plans, wills, and trusts. Contact either of our offices in Syracuse or Watertown for more information, or to set up an appointment. Medicare is a federal program that provides some medical coverage for Americans over the age of 65. The program also covers some people with specific disabilities. Medicare is made up of four parts, including hospitalization coverage, insurance, supplemental insurance, and prescription drug coverage. While Medicare does not cover all of these costs, they can help reduce these costs significantly, which is important for older Americans on fixed incomes. Medicaid is a program administered by the federal government and your state that is designed to help low-income people afford their medical care, along with long-term care, including nursing home stays and in-home medical care. Every state has different requirements, which can make it extremely difficult to know whether you meet these requirements, as well as what information you will need to provide. Each state also provides a different amount of money for procedures and needs, so you need to speak with an attorney who understands how the program functions, how it can benefit you, and what will be covered, and what won’t be covered. As each state runs a different Medicaid program, finding accurate information online that applies to your state can be difficult. These programs tend to change fairly often as they are hot-button political issues that routinely find themselves in the middle of federal and state political arguments. In order to be able to use these benefits, it is a good idea to enlist help from an experienced attorney who understands the system. If your application is denied, you may have lost a significant investment of time, and you may have seen your medical bills increase while you wait for help from the program. You can avoid this vicious cycle by contacting an attorney. 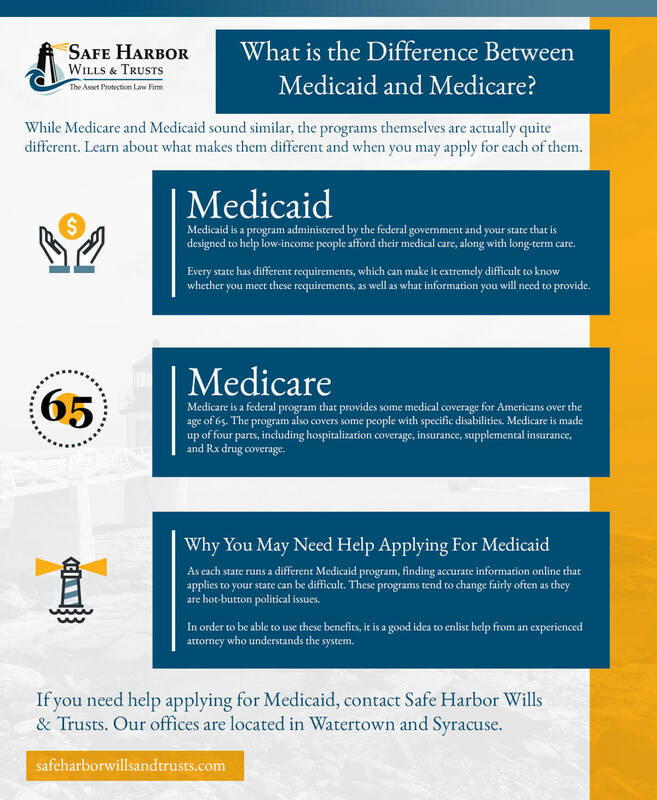 If you need help applying for Medicaid, contact Safe Harbor Wills & Trusts. Our offices are located in Watertown and Syracuse. In addition to helping people with Medicaid applications, we also run free workshops that cover some of the best ways to protect your assets as you age. When you attend, you will receive a free consultation with our attorney, where you can discuss the best ways to keep everything you have worked for safe. Sign up to attend one of these workshops here, or call us for an appointment.